Although The Working Stiffs recorded Time Off in their trademark one-weekend-at-the-beach fashion, the album, in many ways, took years to record. Songs such as Laugh Lines, The Bag, and Soul Gazing waited years for the right line-up to record them. Once bassman Jeff Ommert was in, the band could finally play them the way they deserved to be played. Having assumed dual roles of recording and performing on Tsunami Tsessions, Jim and Stan knew that they wanted to bring in someone to assume the recording engineer role for Time Off. Tommy Barth’s skills, ears, and attitude made him the right fit. Once again, the beach house was converted into a makeshift studio with dining room as drum pit and bedroom as guitar booth. This time, however, Tommy ran a snake to one of the upstairs bedrooms, which he commandeered as the recording booth… complete with ocean view. 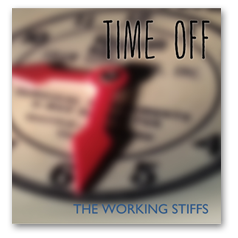 As is their custom, The Working Stiffs recorded most of the songs on Time Off live, in only a few takes over two days. Jeff and Armando left on Sunday afternoon, and Jim and Stan began recording solos until, at 4:45 AM on Monday, Jim mumbled, “I think I need to sleep.” With his usual enthusiastic tone, Tommy replied, “I think that’s a good idea.” After a few hours of sleep, the trio resumed recording until it was time to clean up and pack. Solos were finished up at Tommy’s studio as were vocals. Claudia Knauer recorded backing vocals in two sessions, and Bob Cole recorded the solo on Where It Hurts in a few takes. Tommy, Stan, Jeff, and Jim did the final mix, and Justin Phelps mastered the mixes at Cloud City Sound Studios. The Working Stiffs make music simply because they love to. Playing together takes them back to where it started… just four guys hanging together creating music for the fun of it.